How Money is Created Out of Nothing! Booms and Busts. Both are inevitable in our current fiat-money/debt-based financial system. There’s just no getting around it. It’s a system designed to pad the wallets of the banking community to the detriment of everyone else. If you understand the concepts of inflation and deflation (that they’re a measure of the quantity and subsequent value of currency), and how our system works, then you know we have only one direction left to go—depression. That is, unless we change the system. But governments don’t change until after a catastrophe. That’s history. The system must eventually be changed, or we’re about to witness the demise of civilization as we know it today. Inflation creates a “boom”; delation, just the opposite. Inflation is an increase in the amount of currency in circulation. More money in society is good for commerce—to a point. It’s like everything else in terms of supply and demand—finding the right balance is key to a functioning economy. Left alone, the market will regulate itself. Over time, however, bankers and governments gain control and end up destroying both the market and our livelihoods. It’s happened again and again and again throughout history. They do this through inflating the money system. Let’s take tickets to a soccer game as an example. If you build a new stadium in your city, you need to get the number of seats right for the size and interest of the community at large. If there are too few seats, the price of tickets is likely to go up, and may be prone to scalping. There’s not enough of them to fulfill demand. However, if you build the stadium with too many seats, guess what? You’ll probably have to discount the price of the tickets to fill the stadium and may end up giving away a certain amount of them. Too many tickets reduces their value. It’s the same with money. However, you don’t necessarily see the value of money fluctuate. There’s nobody selling a $20.00 bill at reduced rates. What happens is that the prices of products and services reflect the value of money. If there’s lots of money in circulation (more than necessary to meet basic needs), then prices of products and services go up in price (e.g.- houses and cars). In actual fact, it’s money going down in value that causes prices to increase. On the other hand, if people are losing jobs, and the economy is faltering, the value of money goes up—there’s not enough of it to go around. Therefore sellers of products and services have to discount their prices. There aren’t enough people with discretionary income to purchase those soccer tickets. You have to discount the price to make them affordable. That’s deflation. The solution, of course, is to get more money in circulation. But, our monetary system makes it almost impossible to do that. After all, the government isn’t giving away money to everyone. (Well, not unless you live in one of the Nordic countries, like Sweden, Denmark, Finland, or Iceland, where they’re considering a basic income program). To understand how money gets into the current monetary system in place in all the G7 countries, you need to understand fractional reserve banking. Private banks (owned by private bankers) in all the G7 countries create money in their respective economies. When they create money, they’re also creating debt. To create debt, they need willing participants, like you and me, to take out loans. That how we create inflation. If there aren’t enough loans being created, the money supply deflates, and we go into deflation (a recession or depression). Let’s take a look at the system in depth to really understand what’s going on here. We have a money system called “fractional reserve banking.” Sounds complicated, but it’s not. The government requires that private banks keep a fraction of the money they lend out in reserve. So let’s say the fraction they’re going to keep on hand is ten percent of what they lend out. If that sounds a little weird, that’s because it is. Actually, it’s downright crazy! It’s fraud. 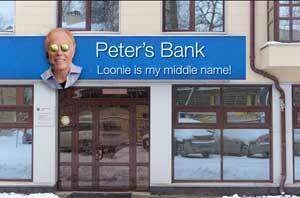 Let’s say I open a bank – Peter’s bank. My slogan is “Loonie is my middle name.” Let me explain. In Canada, one dollar is in the form of a coin. It has a picture of a loon on it (even though the loon is not our national bird, it “flies wild” all over Canada—perhaps a metaphor for inflation …). Back to my slogan: I’m picking this slogan just so people know I’m really knowledgeable about banking … haha, and “loonie” is an appropriate word for a money-lending system that makes no sense. As a newbie banker, I’ve been able to raise $10,000.00 in equity from investors and $5,000 in savings from clients. I’m going to peg $10,000 as the reserves I need and stick that in my bank vault for safe keeping. I also need a “float” (money to be used day-to-day for people who want change in bills and coins, or to retrieve some of the deposits, etc), so I’ll go to the national treasury (in Canada, it’s actually the Bank of Canada that prints our bills and coins) and buy $5,000 worth of hard cash. Nobody ever wants a lot of money, so the rule of thumb is you have to have enough cash on hand to handle day-to-day withdrawals for a period of 30 days. That’s all the amount of money a bank legally needs to keep on hand. With that, I’m in business! Scary, eh? Let’s go back to the vault. There’s $10 thousand in there and that means I can lend out $90k … because I have to keep 10% on hand (100,000 – 10,000 – $90,000). That’s the fractional reserve regulation. OK, now let’s say Fred comes in and needs a loan of $50,000.00. That’s OK because because 10% reserve banking allows me to lend out $90K, even though I only have $10K to back it up. Crazy, right? But, that’s the law. After Fred’s approved for the loan, I press a computer key and guess what, $50K appears in his account! It’s double entry accounting so it’s entered as a $50K liability to Fred (that’s the money I’ve placed in his account that he must repay at some point). On the other side of the balance sheet, I also enter $50K as a bank asset, because I expect to get paid back, so I’m allowed to call it an asset … even though there’s not actually anything there. And voila … I’ve created money. Fred has 50,000 digital dollars that he owes me and I have an asset of $50K. Plus I still have another $40K (sort of) that I can lend out just the same way. My payback as a banker is the income I’m going to get in compounding interest to allow me to keep that computer key greased up and ready to go again (that’s about all I have to do for the interest income). And the longer you don’t pay me back, the more interest you owe. In fact, if I get 10% in interest, after 7 years, I will have made $50K in interest payments. Pretty good business! A good return for pushing a button on a computer and greeting you at the door with a big smile! Now, let’s say you bought a car and that $50K goes to the car dealer. The dealer puts it in his bank account and you get your car. But what’s really interesting is that $40K of that $50K that’s going into the vault of bank #2 is loaned money (debt). So in actual fact, bank #2 can loan out $450K with only $10K of actual unencumbered money … in another bank. That $450K that bank #2 loans out isn’t really backed up by anything! This goes on and on and you can see that the new money increases many times over, as does the debt. 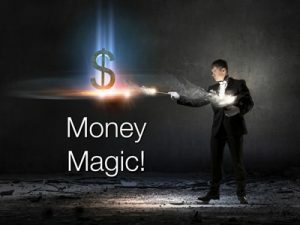 In fact there’s a real incentive for private bankers to increase the money supply, because they have no costs (other than overhead), it creates an asset on the balance sheet, and they’re making money in interest as they sleep. It’s an upside down pyramid scheme. The more loans, the greater the debt, the risk, and the digital money in circulation. That’s OK as long as the debt gets paid back on an ongoing basis and more money is created. But when the economy begins to falter, well, that’s when things get a little weird. What happens is that first, the government lowers interest rates to try to get people to borrow more. This causes the population to think that the money is almost free and so they go to the bank for more loans (to buy houses, which increase in value with the additional money in the economy). The banks aren’t making as much interest income on each loan, and so they’re happy to compensate by issuing more loans. After all, there’s really no additional cost to them to do so. The banks are not really all that worried, because there’s deposit insurance. After all, not everyone wants their money all at the same time … until they do. What we have then is a bank run. Because deposit insurance can handle less than one percent of the problem (that’s all the money that’s in “the kitty” after the crash in 2008 we call the Great Recession). It’s completely inadequate. And that’s why in 1818, 1837, 1857, 1873, 1893, 1907, and 1929, there were runs on the bank. The routine happens over and over and over. That’s also why you want to pay close attention to what’s happening this year in the economy. Because if there’s even the slightest indication that any of the big banks are facing issues, I’d want to be the first one in line to get the “real” money you put in in the first place … in cash! Oh … one more thing you should know. When you deposit your savings in a commercial bank, you are (by law) investing in that bank. The money legally belongs to the bank, not you. But they provide a “promise to pay it back” when you want it. (unless it’s not there, of course). That’s the law. The bottom line is that more money in circulation fuels inflation. Everybody’s happy in the short term, because the economy appears to growing as prices gradually rise (we’ve been brainwashed into thinking this is good), even though the irony is that it’s slowly eroding our standard of living. Our wages simply don’t keep up with rising prices. Over the past one hundred years, our money has been inflated to the extent that a dollar is now worth four percent of what it was originally worth—that’s right … four cents. No wonder it’s getting tougher and tougher to pay your bills and keep up your lifestyle. 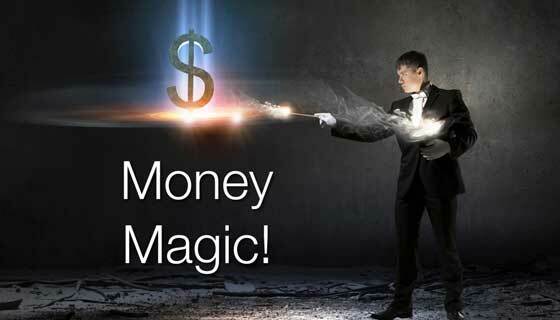 In fact, it’s impossible, because governments and banks have been robbing you by debasing your money! We’re also paying back those loans in tomorrow’s dollars, which are gradually being reduced in value because there are more of them in circulation, which makes the debt easier to pay off. But when deflation becomes the norm, tomorrow’s money becomes scarcer and increases in value, so it becomes more and more difficult to pay back yesterday’s loans. Once we reach a certain point of inflation, prices reach such a height that we can’t afford the products and services. The economy levels off, purchases stagnate, people start to lose jobs, mortgages become harder to pay, real estate prices level off, and we start down that long, spiralling, deflationary road. Governments, although they promise just the opposite, usually add to the dilemma, with policies that are deflationary. That’s where we are today. It’s not a pretty situation. In fact, it’s downright disturbing! Here’s a list of the things that we, as well as governments and banks, do to exacerbate the problem—to feed the deflationary spiral. Once you get into a deflationary period, the last thing you want to do is take money out of the economy (out of circulation), because that only makes the situation worse. Paying Down Debt: Under the current system, with double entry accounting, paying down debt actually makes money disappear—it takes it out of circulation. 97% of money these days is digital (it doesn’t really exist in reality—it’s a digital entry in a computer, moved from bank to bank) and when you reduce the liability side of double entry accounting, the asset side also gets reduced by an equal amount. In other words, the loan that created the money eventually goes back to zero. The asset disappears, as does the liability. Banks have fewer assets on their books. 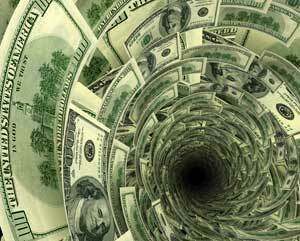 In any case, money leaves the economy; it disappears back into nothing. This is deflationary. Hoarding Cash: There are two sides to this coin. In an inflationary economy, the wealthy get richer and the poor get poorer. The wealthy become so rich that they have more money than they can ever spend and it just sits there idle. Because they tend to own assets that attract interest or one type or another, there’s a never-ending stream into their bank account, taking even more money out of the economy as time goes on. On the other hand, the poor and middle class start to lose confidence in the economy. In Europe these days, people are already stashing money away in basements and mattresses. This reduces the “velocity of money,” which is another way of saying there are fewer and fewer transactions taking place (there’s less money in circulation). This is deflationary. Fewer Loans: Banks begin to worry about the amount of money they have out in there in the economy, particularly as loans start to go bad. Businesses start to fail and mortgages start to default. Banks start to reduce the number of loans they make, further reducing the amount of money they’re creating. Creating loans (debt) is the only way we have to create more money in today’s monetary system. Fear of loss results in banks not lending—this is deflationary, of course. Another way to inflate is to reduce taxes, but in today’s world, for all the same reasons, governments are bankrupt, and lowering taxes is the last thing they’re going to do—they need the income too badly. Taxes are going up. Compounding Interest: Compounding interest is the core of the problem. When you pay down debt, you’re actually reducing inflation. In other words, you’re paying back new money that was created out of nothing. But when you pay back interest, you’re paying it with existing money that’s already out there in circulation. In other words, you pay back the principle you borrowed, but you have to go out into the economy and find additional, existing money to pay back the interest you owe on top of the debt. Paying back the interest is actually taking money directly out of the economy. It’s deflationary. Inflation: Inflation in itself, over a long period of time, actually causes deflation. It gradually lowers the value of our money until it’s worth so little that we can’t afford to buy any “nice-to-have” items. So we stop spending except for the basics. Retail sales tank. Business start to fail. This is deflationary. Minimum Wage: The raising of the minimal wage is what finally killed the Roman Empire. The army demanded more money because the value of the currency of that time had declined to about 5% of its original value (ring a bell?). Increasing the wages of the army (it was so large) bankrupted the treasury. Today, raising the minimum wage forces employers to reduce the number of employees. That’s because deflation has already decreased the number of transactions and the amount that people are willing or able to pay for products and services. Employers end up getting squeezed on both sides. The rise in unemployment becomes a bigger drain on government and the economy in general. It’s a deflationary move and it always happens in the early stages of a deflationary environment. Increasing Taxes: The recent move to energy taxes (we have an energy tax in my province of Alberta that 63% of the population disagrees with—and, of course makes no sense from an environmental perspective) that takes money out of the economy. Governments always do the most stupid thing at the most ridiculous time. The Sharing Economy: The “sharing economy” is both a result of deflation and leads to additional deflation. It reduces the number of monetary transactions in the economy and reduces the average dollar amount of these transactions, both of which are deflationary. Rise of the Value of the Reserve Currency: This is an indicator of deflation. The US dollar is the reserve currency (still) and as it increases in value, it indicates the fact that deflation is increasing. When the value of money increases, there’s less of it in the economy. Prices of assets (houses and care, for example) decrease, along with wages, and employment. Increasing Bank Reserves: As the private banks start to experience more and more bad loans, there’s a move by central banks to require them to increase their reserve percentages. When they do that, of course it reduces money in circulation. If you reduce reserves from 10% to 15%, that extra five percent is taking out of the economy and goes into the vault where it sits there waiting for the eventual bank run. This is the crazy system we’ve had in place ever since the Bank of England was formed in 1694, a system based on usury, with the Rothschild family dynasty (central bankers) at the core. It’s a predatory system that’s ruined the world’s economy. It’s what the upcoming revolution is all about. It’s going to get really, really nasty. These banksters play hard ball and they don’t like to lose. But they will. And so will we. If only everybody understood this! Thanks, Peter. Your fractional banking example is wrong. If the bank has 10,000, it can only lend out 9000 to Fred. That would be 1000 in reserve. When Fred spends the 9000 on a car, it gets deposited in bank 2, then bank 2 can lend out 8100 to Tom, keeping 900 in reserve. Tom can use the 8100 to buy his car. The first transaction is fine, but the second bank is the one creating money. We started with 10000 but spent 9000 plus 8100 = 17100 on cars. That’s how the banks inject money into the economy when they create debt. Your comment seems to infer that banks lend out money they have (9000), which, of course, is not the case. The 10K the bank has are “reserves.” They’re not going anywhere. When the bank makes a loan, it creates new money out of thin air by clicking a computer button and putting say, 10K in your account as a digital entry. It needs to be backed up by 10% in reserves. This is how money is created from nothing and increases the money supply, thereby creating inflation. The money deposited in bank B is newly created cash from bank A, not money bank A had on hand. Ray Dalio made a video called the how the economic machine works. In his opinion, the three main forces that drive economic activity are productive growth, the short debt cycle and the long-term debt cycle. In your opinion will the end of the long-term debt cycle force the central bank to restructure debt because credit levels are too high in comparison to income through deleveraging? Your question tells me your premise is incorrect. Private banks create money and debt. For example, the Federal Reserve is a private bank. When the crash begins, debt will explode, but private banks are the ones affected. I don’t think central banks (the BIS) are going to do much to help when the SHTF. Governments around the world are going to be on the hook. The IMF, which bails out countries will be overwhelmed. Countries will eventually revert back to their own currencies. For example in Canada in 1937, at the height of the depression, we created our own central bank (which we haven’t used as a central bank since 1974). When we did have a central bank that worked, we created our own money in Canada through the Bank of Canada. However, we’re an anomaly. Most countries don’t have their own central bank; they rely on the BIS which “regulates” the creation of money in each of the countries it “controls” but doesn’t actually provide it. Private banks in each country actually create the money and they’re the ones in debt. The European central bank controls the SWIFT system and for countries that use that system for monetary exchange, BIS charges interest. It’s a complicated system. However, while debt in countries will bankrupt them, it will be up to individual countries to figure out a solution. I wouldn’t count on the central banks to do much of anything once confidence in the current system implodes. The BIS is a secret cabal of private bankers. They’re in it for themselves. Thanks for writing such an informative article. I have a question pertaining to your Peter’s Bank example. Let’s say your bank lends me the $50K from your example and I come in a few days later and pay back the loan in physical cash (e.g., $50,000 cash to pay back principal and let’s say $100 of cash for accrued interest). Wouldn’t the principal portion of the repayment be retained by your bank as an asset after the loan was satisfied and crossed off the books? In your article you mention that when a loan is paid back the asset gets cancelled off the banks books and it’s really only the interest paid back that ends up being retained as an asset. How can this be? I can’t imagine the bank would light the $50K of physical cash on fire to get rid of it after receiving it as payment. Seems like the principal repayment itself would be all profit for the bank and whatever interest repayment given is just more cream on the top. Am I missing something? This is an important question that I’m planning a video around. The answer will floor you and that’s what makes this entire system so inconceivably stupid. The 50K never existed in the first place. It’s digital money the banks are allowed to create, which creates a liability because you owe that money to the bank once you’ve borrowed. 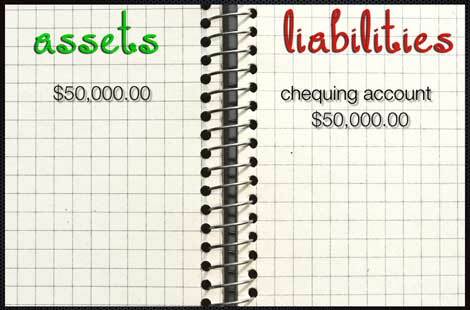 Because balance sheets need to “balance,” they record 50K on the asset side, even though there’s nothing there. Now, when you pay all that money back, the liability disappears; it goes to zero. So does the asset. So, the money is actually destroyed; it goes back to non-existing. This is how inflation is created when you borrow and deflation when you pay it back. The bank gets to keep the interest you pay, which goes to income, not the balance sheet. Make sense? Well, no, it actually doesn’t — not logically, but that’s how our wonderful banking system works created by banisters for pretty much for their own good. It’s the reason why when mortgages start to default (which has already begun), the world financial system is going to be in a whole bunch of trouble and we’re going into spiralling deflation. Thanks for the question. Sorry for the answer.